Over the next four years, internet traffic is expected to quadruple, the number of internet connected devices will outnumber the world population three-to-one, the total percentage of internet traffic from video will be upwards of 82 percent, and there will be 4.6 billion global internet users. We’re heading toward a world where today’s already fast internet speeds will be insufficient for the technologies and experiences we’ll demand. Fortunately, internet providers across America are building their networks not just for what’s required today, but for the needs of the future. Recent gigabit projects from Mediacom, Comcast, Altice, and others are highlight how getting a jump on super-speeds can not only help future-proof America’s internet networks for tomorrow, but deliver amazing opportunities for customers today. Comcast reports it will deliver gigabit internet in Utah via connections that are already in people’s homes by leveraging all-new DOCSIS 3.1 technology. Altice announced it would be rolling out an all-fiber network to its customers. Calling the initiative “Generation Gigaspeed,” the FTTH network will be capable of 10 gigabits per second. Mediacom recently revealed that its entire Indiana footprint now has access to 1 gig internet service. They’re the first major U.S. cable provider to fully transition to the new DOCSIS 3.1 platform. Midco’s Xstream Gig is now available to more than 50 percent of its customers, many in rural Minnesota and the Dakotas. GCI offers GIG red to some of the farthest reaches of Alaska. These are just a few examples and while remarkable, they shouldn’t come as a huge surprise. Cable companies have been expanding and improving their networks at an incredible clip for decades. In 1994, the fastest available home internet service available was 28.8 kbps via dial-up modem. Today, the top speed available is 2 Gbps. In just the last five years, top speeds have increased 7-fold. 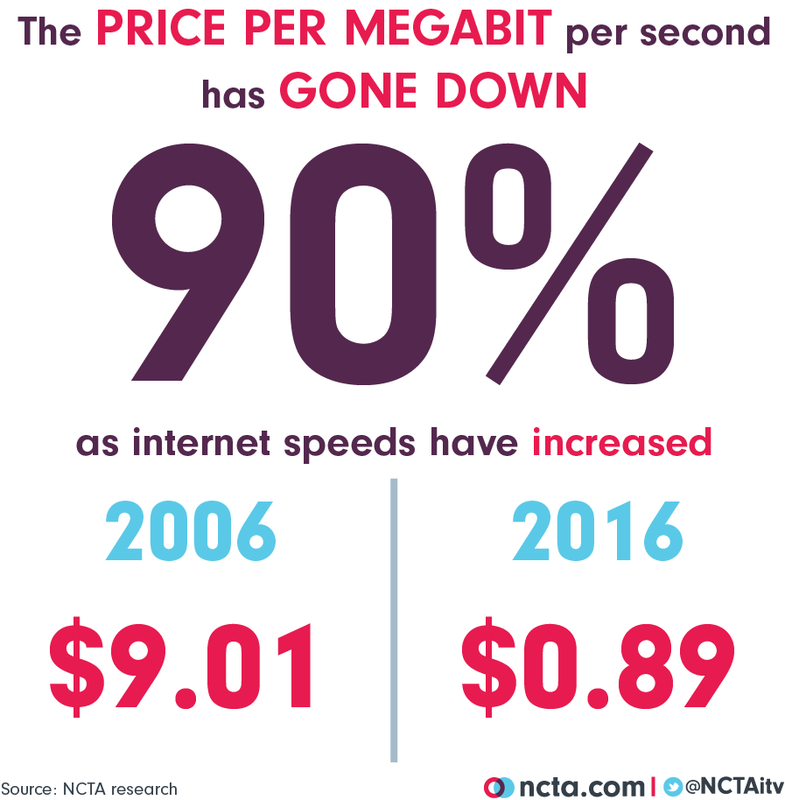 And for all this additional speed, Americans are paying less per megabit than ever before, down 90 percent since 2006. Speeds will continue to go up, access will continue to expand, and the price per megabit consumers pay will continue to drop. This will happen because as our needs increase, internet providers will continue to expand and improve their networks to meet them. It’s what they’ve always done and what they will continue to do. We look forward to whatever comes next.